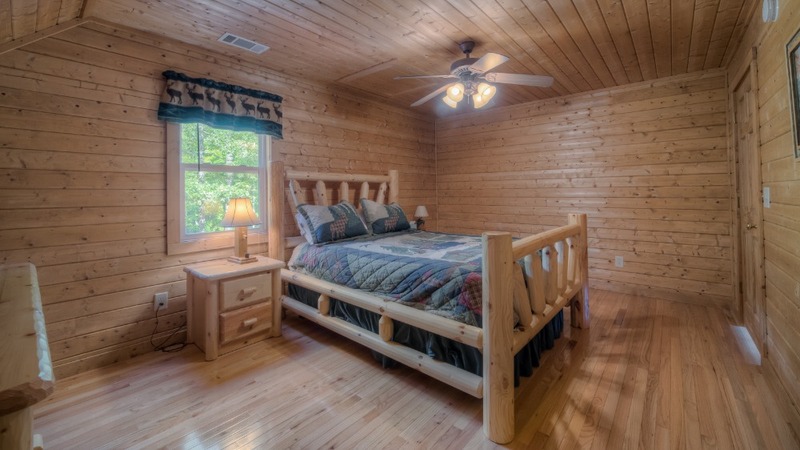 You have a lot of options when considering a Georgia mountain cabin rental, but if you’re looking for lots of space, a magnificent natural setting close to activities and town, and an absolutely breathtaking view, look no further than Cubs Cabin. 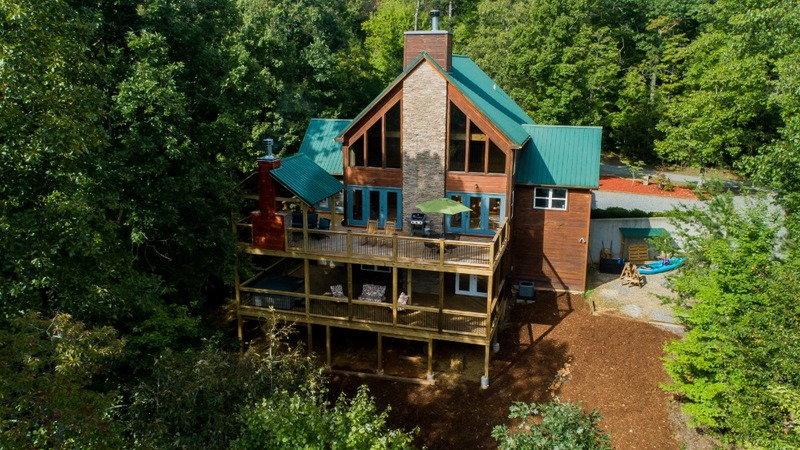 Situated among the trees just four miles from downtown Blue Ridge, this spectacular tri-level hillside showplace offers you the ultimate in privacy, modern comforts, and the beauty of nature everywhere you look. 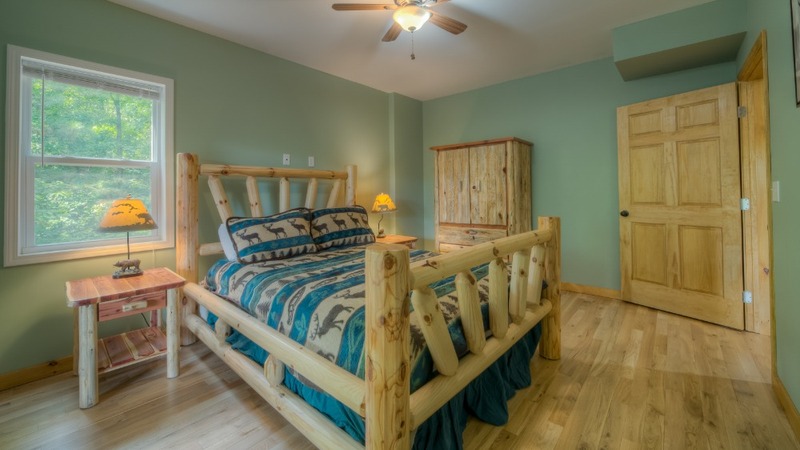 Named in honor of the mama bear and her three cubs that inhabit the woods around the property and the Chicago Cubs, the owner’s favorite baseball team, the cabin has a warm, relaxing, inviting ambience that makes you feel instantly at home. The soaring cathedral ceiling and enormous glass windows on the main level bring the outside in, flooding the home with light and maximizing the view. 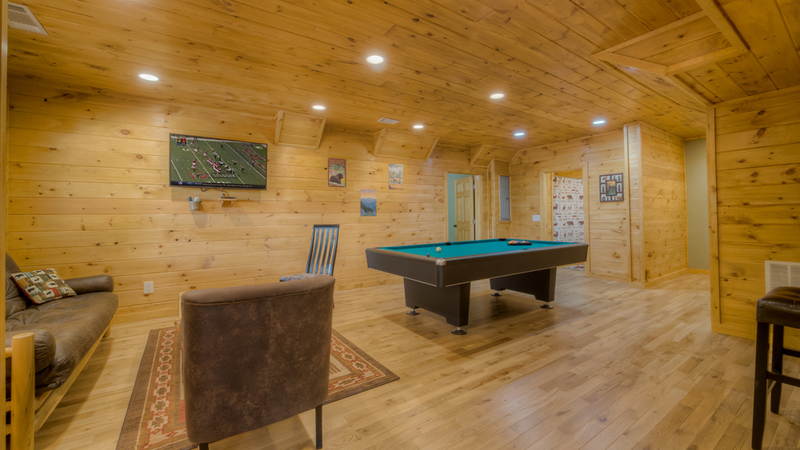 The family room, with its leather reclining sofas, wood-burning fireplace, and 55” TV, is the heart of the home, the perfect spot to gather. 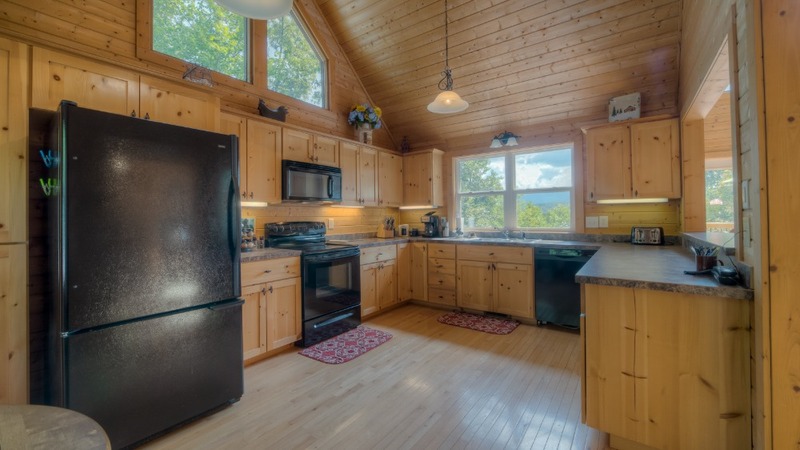 The fully stocked kitchen has lots of storage space, a double-sized refrigerator, electric range, dishwasher, microwave, drip coffeemaker, crockpot and all the implements you need to cook and serve. The dining table seats six, plus two at the breakfast bar. 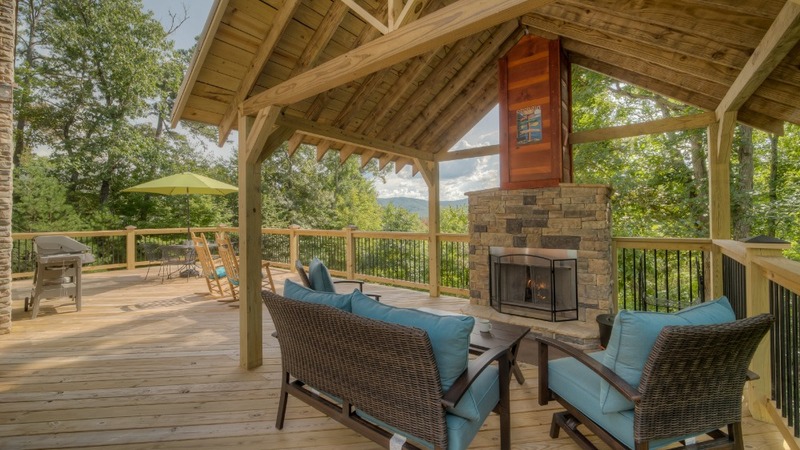 Love to barbecue? 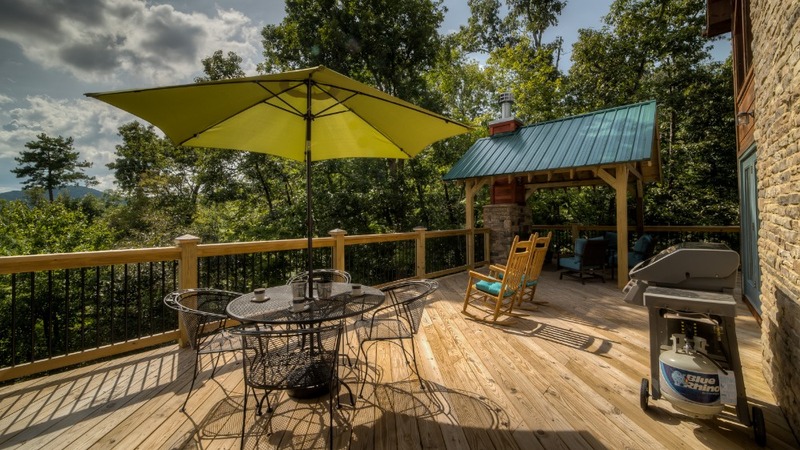 There’s a gas grill on the upper deck, where you can enjoy your efforts alfresco—there’s a patio table with umbrella and four chairs, a pair of rockers, and seating for five around the wood-burning fireplace. 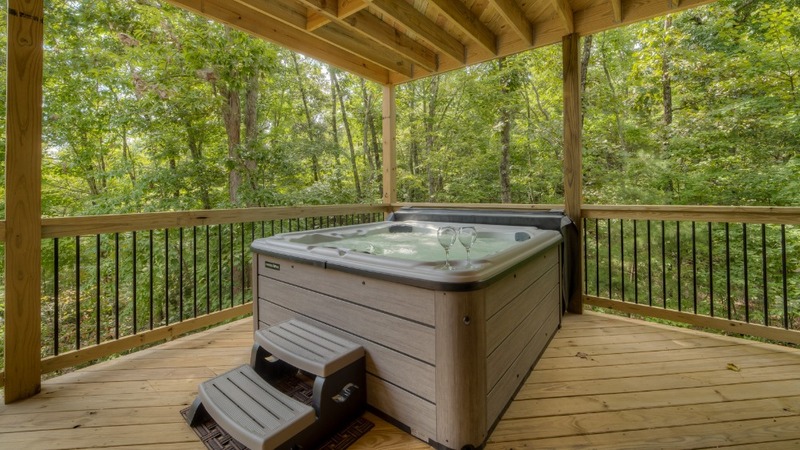 On the lower deck, the six-seat hot tub gives you a beautiful view of the mountains as you soak your cares away. 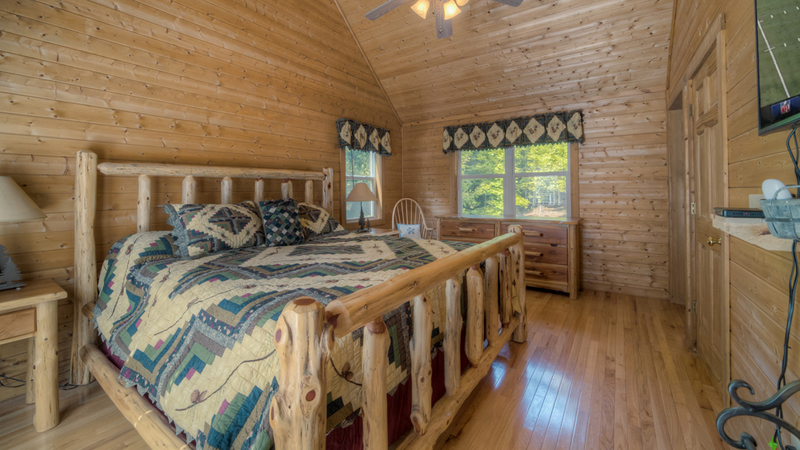 The cabin’s three bedrooms are spacious and airy, each with comfortable rustic log beds and ceiling fans. 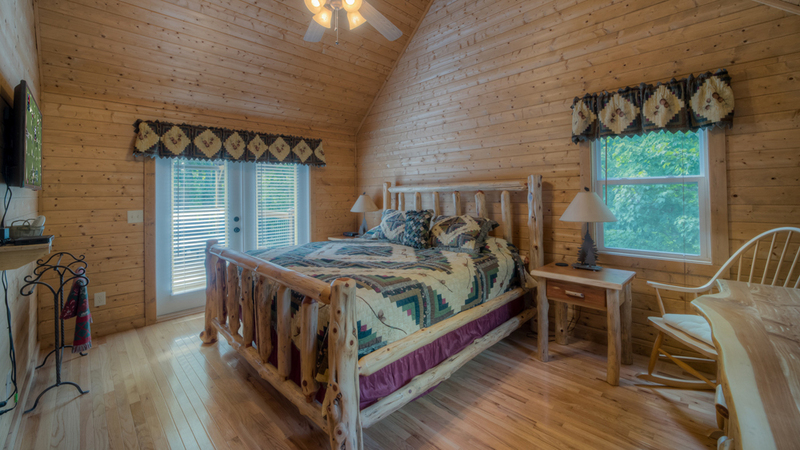 The main level master has a vaulted ceiling, king bed, deck access, a 40” TV and private bath with walk-in shower. 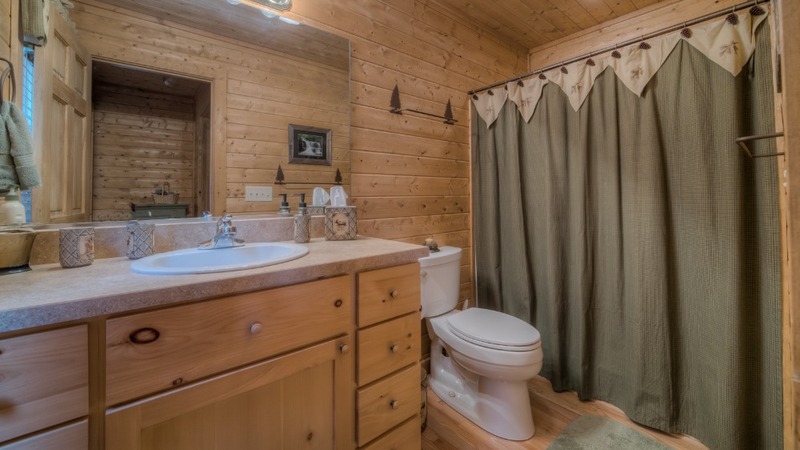 The upstairs bedroom as a queen bed, 32” TV, and its adjacent bath has double sinks and a tub/shower combo. 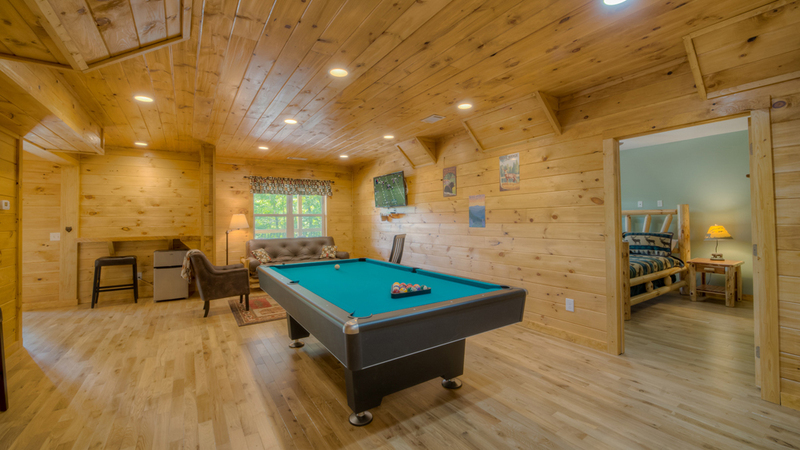 Downstairs, you’ll find a bedroom with a queen bed and deck access, a bathroom with tub and shower, and a game room with billiards, board games, a full size futon, and a 48” TV. 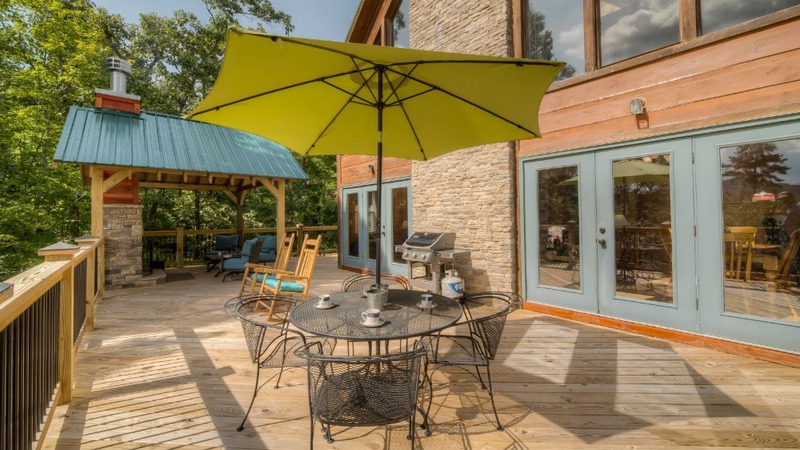 Additional amenities include Wifi, DirecTV, a half bath and washer/dryer on the main level, and parking in the circular driveway. 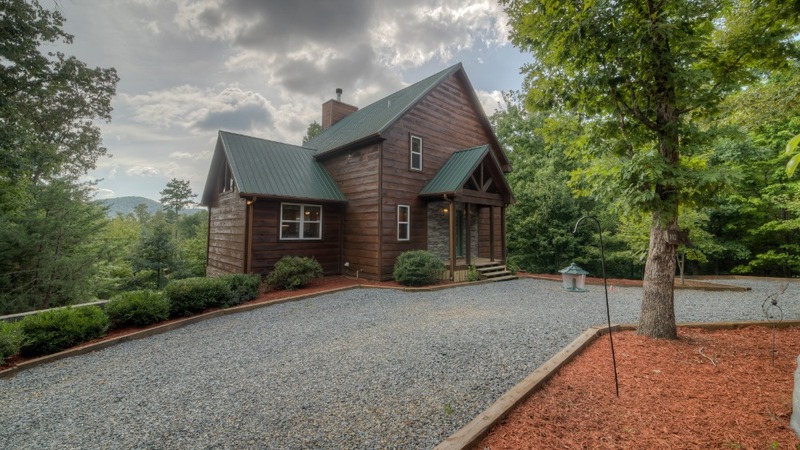 Your rental is near Lake Blue Ridge and its great fishing and boating—the boat launch is just a quarter mile from the cabin. 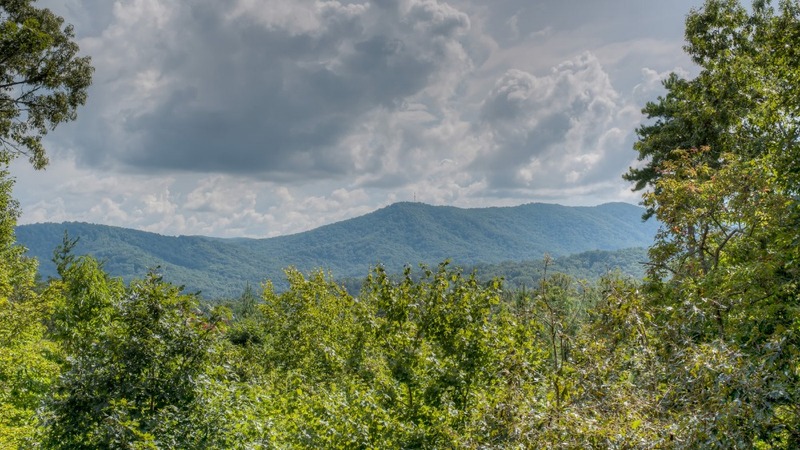 You’re also close to hiking trails, Mercier Orchards for apple picking, the shops and restaurants of downtown Blue Ridge. 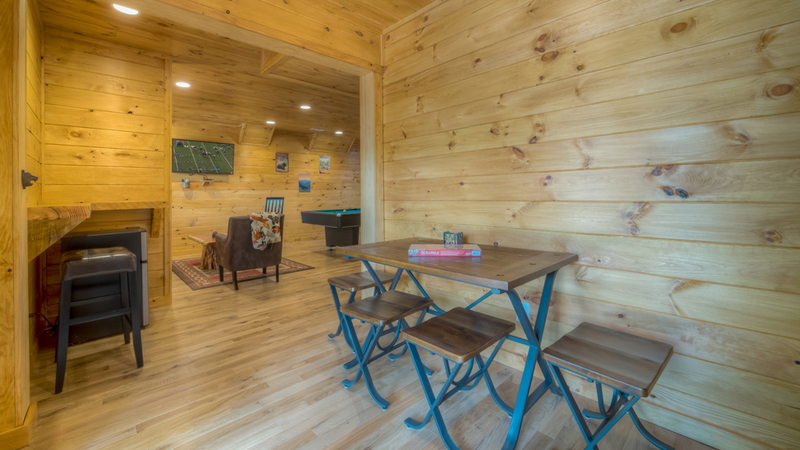 Choose Cub Cabin and you don’t have to leave your canine family members at home. 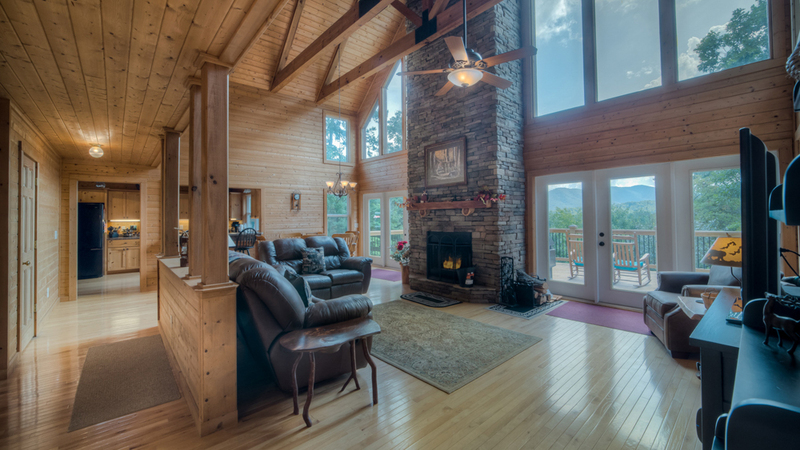 Bring them along to share your unforgettable Georgia mountain vacation. 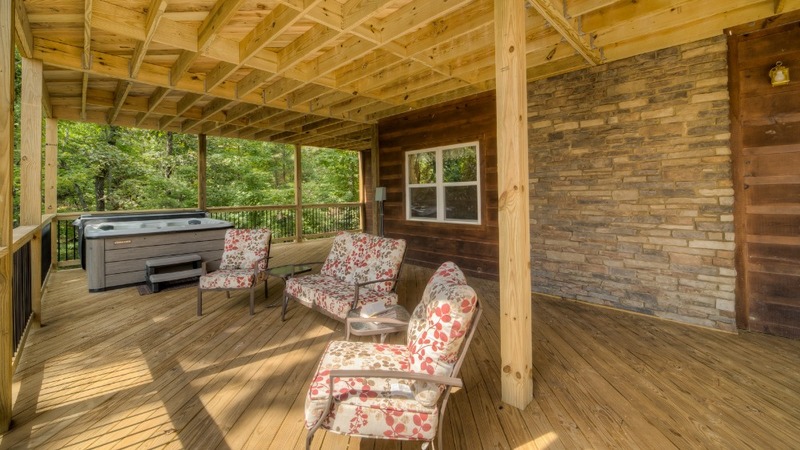 03/19 - Loved the cabin and outdoor fireplace. 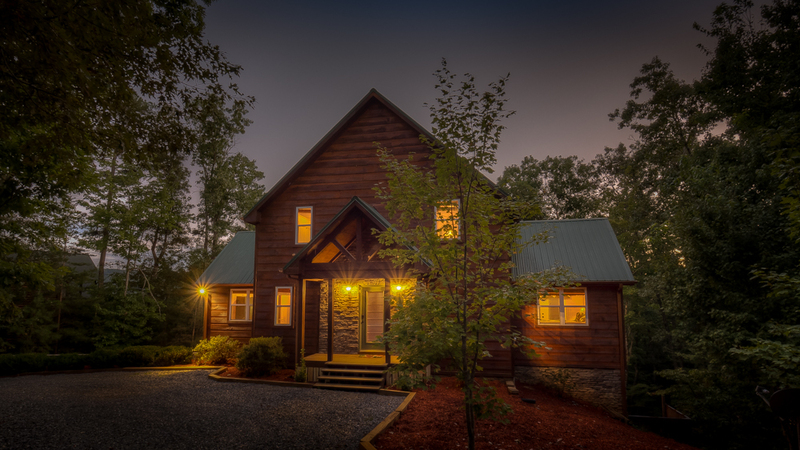 Love Escape to Blue Ridge! 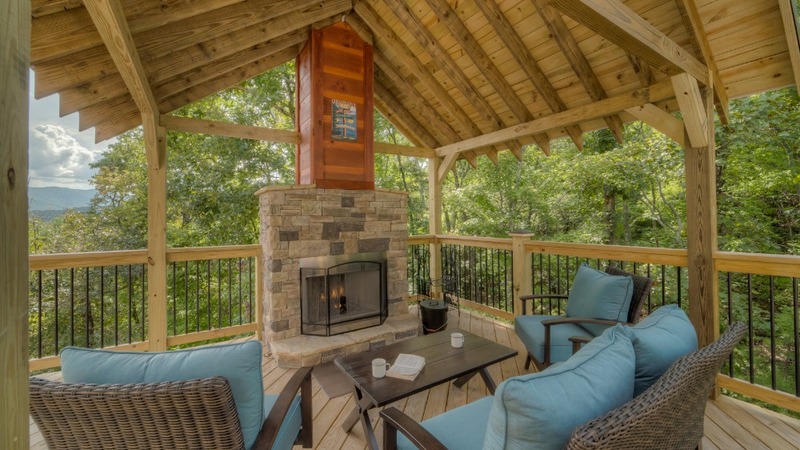 02/19 - Enjoyed the spacious kitchen and the outdoor seating area by the fireplace. Always enjoy dealing with Escape to Blue Ridge staff. They are very helpful and prompt with all information. 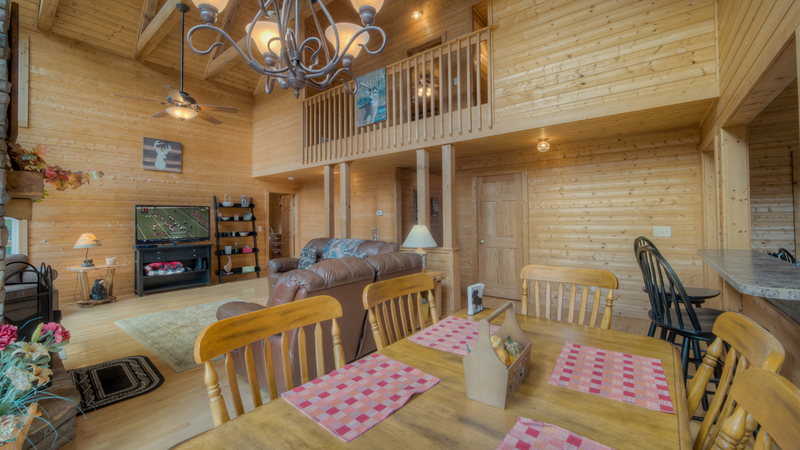 01/19 - The layout of this home with one bedroom per level is perfect for a couples trip. 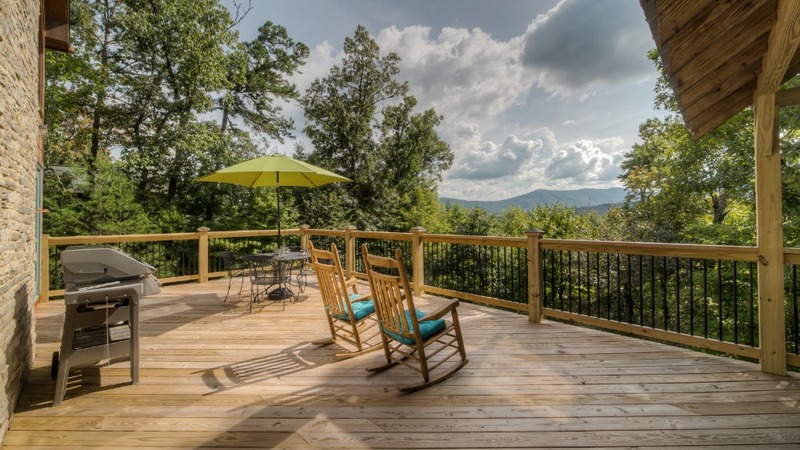 The views from each level and the deck make this cabin one of my favorites thus far!My family has been visiting Blue Ridge for over 10 years and we have never experienced the level of service provided by Escape to Blue Ridge. 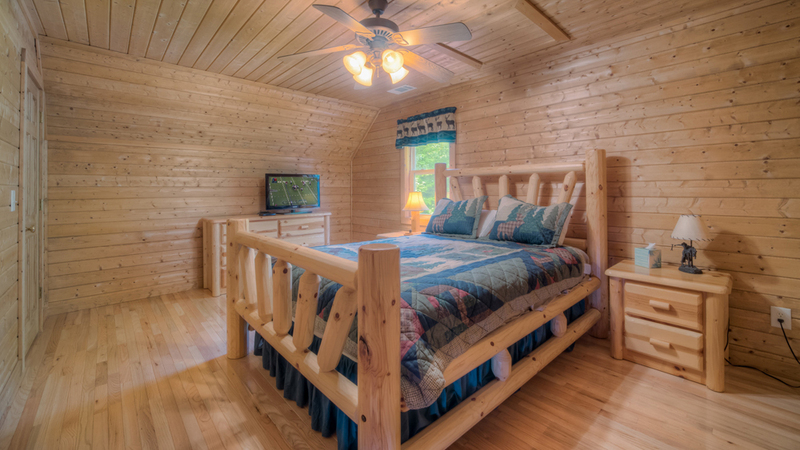 This is our second stay with you all and as long as you are in Blue Ridge, you have a loyal customer. 01/19 - We loved the layout of the home. 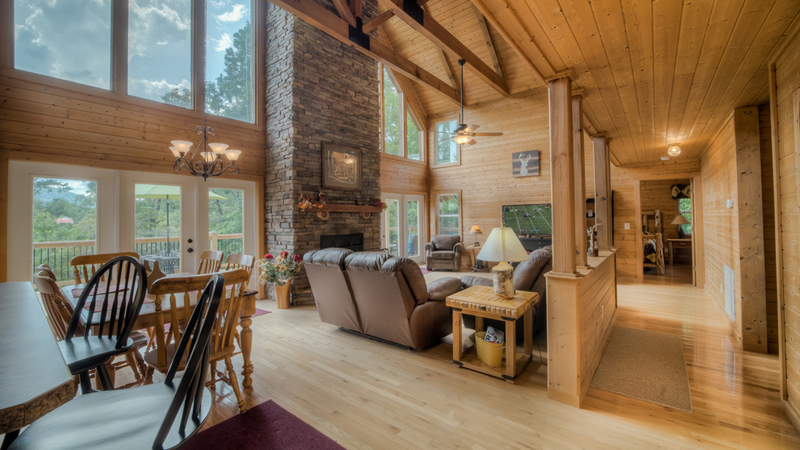 Walking in and seeing the fireplace and surrounding two story windows was an amazing first impression. 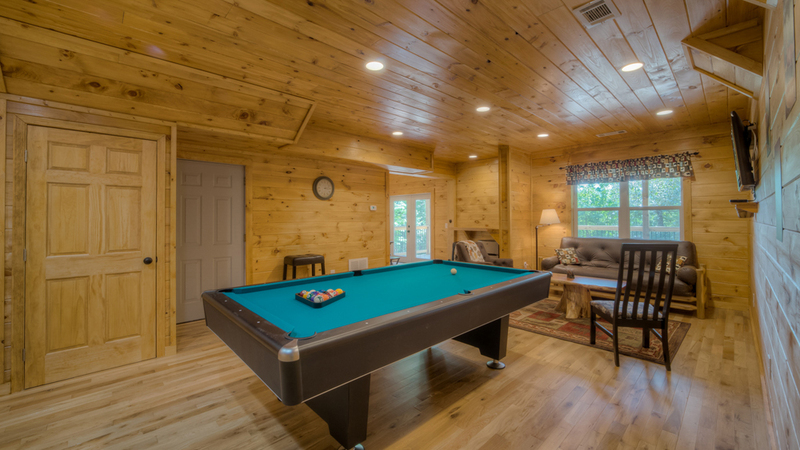 The pool table was in great shape and we enjoyed every minute of our stay. 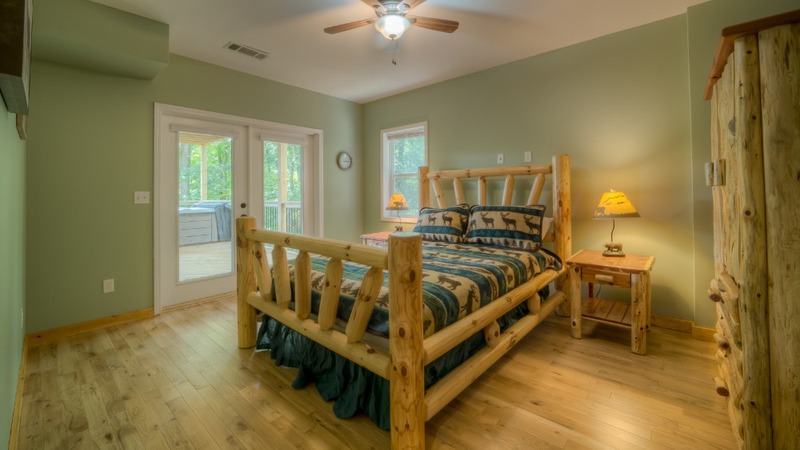 The website is very user friendly and a great way to search for homes. 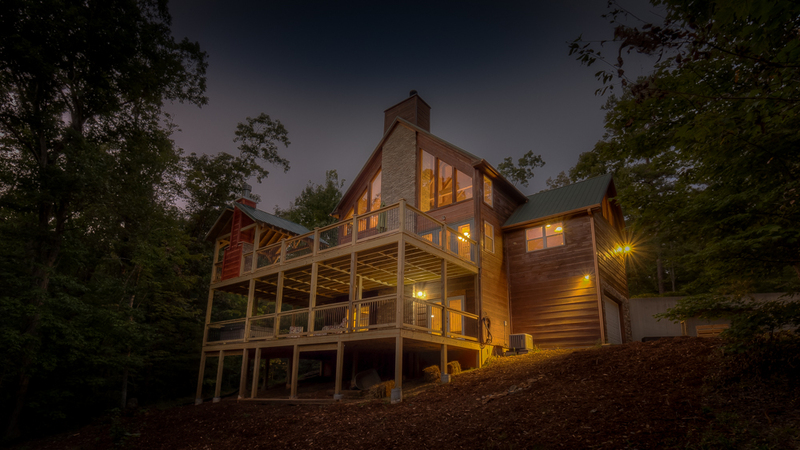 Upon arriving at the home and entering with the music playing and lights on, it was very welcoming. 12/18 - We came during the holidays so the home was adorned appropriately with Christmas decorations, which was amazing. Your company has been a pleasure to work with from the very beginning. 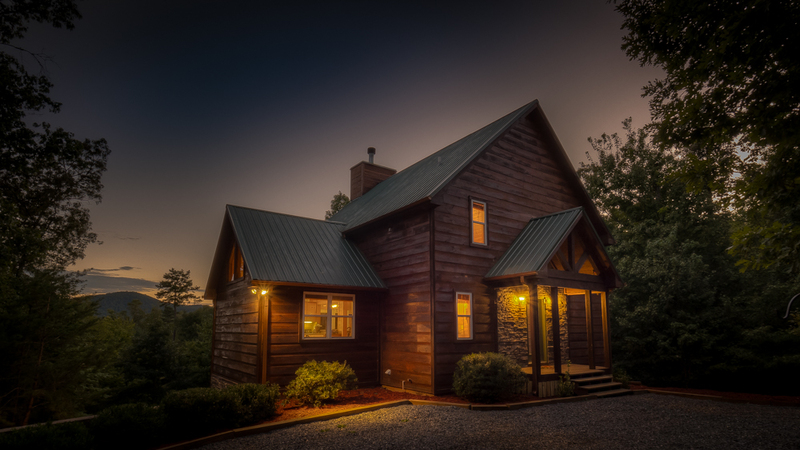 As a first time renter, I thoroughly enjoyed my experience before, during and after my stay in regards to my personal experience with the Escape to Blue Ridge brand. 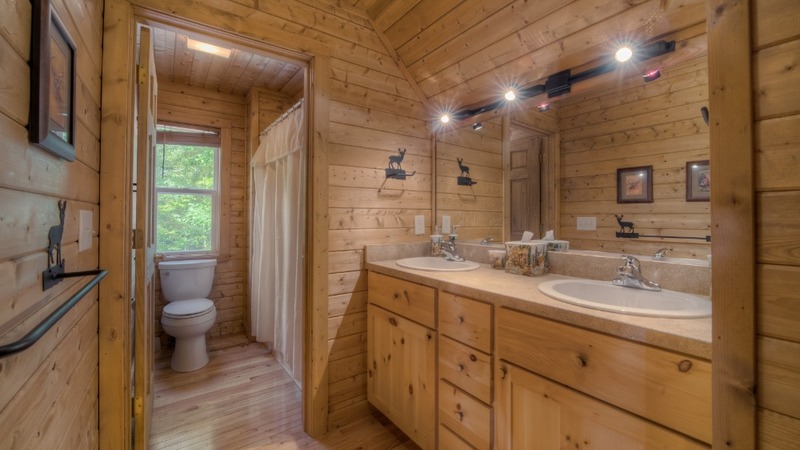 12/18 - Well equipped, clean and beautifully decorated for Christmas. Very professional and top-notch. 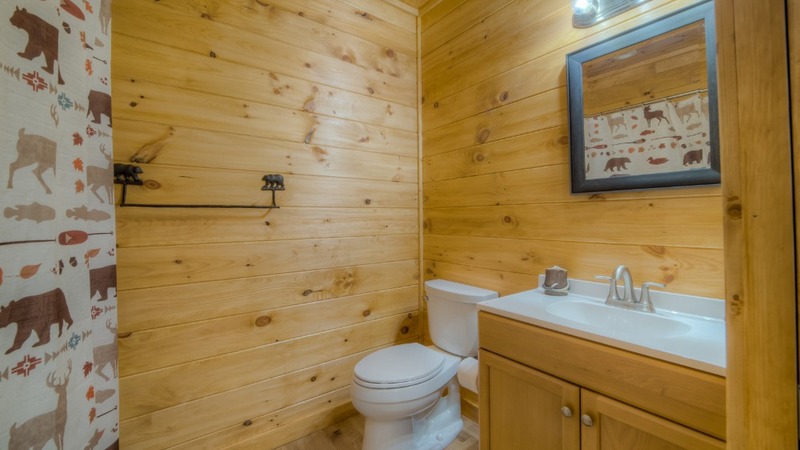 11/18 - Very clean, great view. 11/18 - The view from the top deck was absolutely breathtaking. We had a great experience with the company. 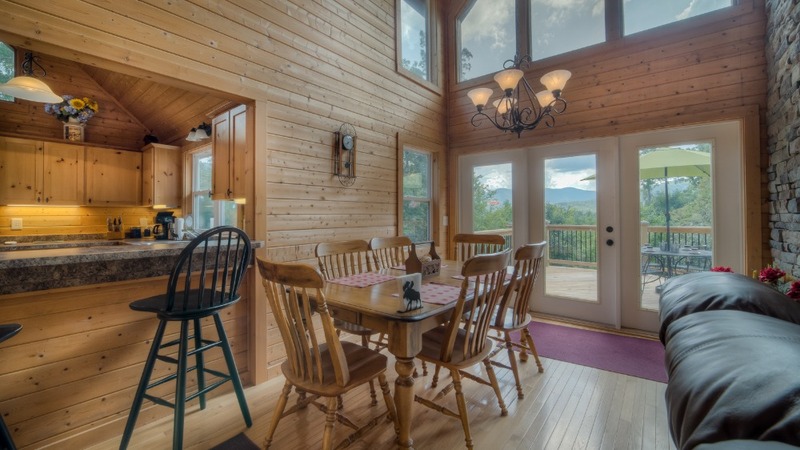 11/18 - Well stocked kitchen, excellent linens, excellent internet and cable tv package. Very impressed with the company. Very responsive. Overall experience was excellent from reservation to check out.